All submissions for the Be My Valentine! event may be made here. This thread will be heavily moderated, only compliments and submissions will be tolerated. Please be sure to read all the rules and information in the original post. If your submission is valid, your picture will be uploaded into our Facebook event album for the fan voting phase! 1. You can make a physical card and take a picture of it! - Physical cards must include their IGN and server IN the picture (either on the card itself or a separate piece of paper). 2. Or you can make a digital one (an e-card)! - Digital cards must include your IGN and server somewhere in the image. 3. Don’t worry! We understand not everyone has the time to make their own cards so here’s a template for those that STILL want to share their love! Download the template and add in your own flavor text for Valentine's Day! Remember to follow our rules and requirements when making your cards (and stick with our Code of Conduct policies!). As long as you’ve got that, feel free to get creative! Make sure they're Taichi Panda-themed too*! 3. Must have a physical placard with your IGN (in-game name) and server if you make a physical card OR write it on the card. Digital cards must include your IGN and server in text on the image somewhere. Template cards must include IGN and server in the post submission. Your entry is NOT valid without this step. All eligible submissions (must follow all rules and requirements) will receive a small participation reward of 200 Crystals. We will also have 1 winner chosen by the community team and 1 winner from Facebook Fan Voting! Both will receive one Valentine's Day Outfit each! 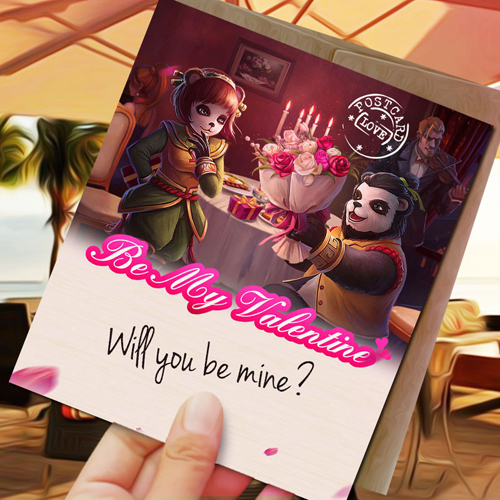 Love is in the air and Cupid's on a frenzy... let's join him this holiday and spread the romance! HAPPY VALENTINES TO ALL TAICHI PLAYER! Last edited by LARAAKINO17 on Fri Feb 12, 2016 10:17 pm, edited 1 time in total. Last edited by MABELLA on Mon Feb 15, 2016 5:40 am, edited 3 times in total. Last edited by Zarralynn on Sat Feb 13, 2016 10:04 am, edited 1 time in total. Im gonna ask her to marry me tommorow, and i'm so emoted . Here is my entry . Happy Valentine's Day everyone !